In case you weren’t aware, Sunday, September 19 is International Talk Like A Pirate Day. 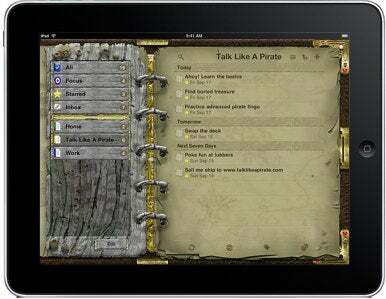 Along with peppering your vernacular with phrases like “Ahoy, matey!”, “Avast, ye scurvy dog!”, and “Yo-ho-ho, and a bottle of rum!”, you can honor this special holiday by downloading the new Talk Like a Pirate theme for Appigo’s Todo for iPad productivity app. Users can download the new theme, which features a rugged and worn treasure map-looking style, via in-app purchase by going into Todo for iPad Settings -> Themes -> More. For the pirate enthusiast, this theme may be enough to persuade one to purchase Todo for iPad, which, according to our review of the product, already “oozes with awesomeness”. So what happens when you combine an awesomeness-oozing app with pirate decor? We’ve never heard anyone report back on the consequences of such a potent combination, so we must advise you to proceed at your own risk. After all, dead men tell no tales. Todo for iPad costs $5 and runs on iOS 3.2 or later. Appigo says its pirate theme costs $2; the company offers a few free papers from within the app and plans on releasing additional paid themes within the next month or so. Updated at 8:20 a.m. PT to include the in-app purchase price of the pirate theme.